A letter of support from the dean of your institution must accompany the application. See Example of a completed application. *Please note that our GHHS resident (GME) chapters pilot has now closed. We are not accepting general applications for GHHS resident chapters at this time. It is important to choose a Chapter Advisor who has a strong commitment to supporting the humanistic development of trainees at your institution. A Chapter Advisor will need to have the time to connect with GHHS members to provide support and guidance. The advisor may or may not be a physician, but must be a member of the faculty and someone dedicated to the delivery of compassionate patient care. Many of our Chapter Advisors are department chairs, directors, deans, or professors. Some chapters choose to have two co-Chapter Advisors. Chapter Advisors develop and implement nomination and selection procedures, update member information with the GHHS national office, plan and oversee the Induction Ceremony, and work with chapter members to implement activities aligned with the mission of GHHS. Chapter Advisors become members of GHHS and are inducted into the Society at the inaugural Induction Ceremony. *we strongly recommend selecting a second Chapter Advisor to provide additional support. Medical student chapters may select no greater than 15% of a medical school class (as defined by the Dean of Student Affairs at the time nominations are made), four faculty members, and up to six residents each year. Schools that bestow the Leonard Tow Humanism in Medicine Award should select the student awardee from the ranks of the GHHS student members, and the faculty awardee should be considered one of the four faculty members inducted into GHHS that year. (Please note that the institutional process to select the Tow Award winners may be separate from the process used to select new student and faculty GHHS members.) If your school conducts the Student Clinician’s Ceremony, the six resident recipients of the Humanism and Excellence in Teaching Award should also be the GHHS elected residents who will be inducted as members. GHHS recommends that medical students be selected via a peer nomination process for membership in their third year as soon as peers and clerkship directors have had time to observe them in clinical settings. Student selection should be completed and new members notified no later than the spring of their third year in order for new GHHS members to bond as a group, design projects intended to begin in their fourth year, and meet with outgoing GHHS members to share ideas and “pass the torch.” Selected students should be humanistic exemplars (see selection process below) for the entire student body. The number of students selected should range from 10-15% of the class. The most commonly used selection process begins with nominations from fellow students based on the Peer Nomination Survey developed by Dr. Wayne McCormack at the University of Florida. The initial group of peer-nominated students is then evaluated by a Selection Committee composed of faculty, administrators, Tow Award winners, and GHHS student and resident members. Nominated students are evaluated on the basis of academic eligibility, program director evaluations, and an additional essay, interview or other indication of the nominee’s willingness and qualifications to serve. The committee makes the final decision. If the offer of membership is accepted by the student, the Chapter Advisor then registers the new GHHS member with the GHHS national office and invites the student to participate in a formal Induction Ceremony. This honor should be noted in the student’s Medical Student Performance Evaluation (MSPE), otherwise known as the dean’s letter. Formal recognition should also take place when other student honors and awards are bestowed. In addition, schools are expected to acknowledge student membership in GHHS at the graduation ceremonies. After the selection of new GHHS members , the Chapter Advisor enters the names and contact information into the national GHHS directory. In order to receive the pins and certificates in a timely fashion, Chapter Advisors must complete the Induction Procedure Form and the Inductee Spreadsheet and return the information to the GHHS national office at least three weeks prior to the Induction Ceremony. Students, residents, and faculty selected to become members of GHHS should be recognized in a formal Induction Ceremony. This ceremony may be held at any point between the completion of the selection process and graduation. Most schools choose to host a lunch or dinner soon after the selection process for new members and their invited faculty, family, and friends. We encourage a formal program, with remarks from the Dean of the Medical School, the Dean for Education, the Chapter Advisor, and an invited speaker. GHHS members may select up to two faculty and up to six residents (for UME chapters) to be inducted into GHHS. Schools that bestow the Leonard Tow Humanism in Medicine Award should select the student awardee from the ranks of the GHHS student members, and the faculty awardee should be considered one of the two faculty members inducted into GHHS that year. (Please note that the institutional process to select the Tow Award winners may be separate from the process used to select new student and faculty GHHS members.) As noted above, the Chapter Advisor should contact the GHHS office to obtain certificates and GHHS pins for all new members. During the ceremony, each new GHHS member can be invited to come forward to receive a pin. When they are all assembled, ask them to pair off and place the GHHS pin on one another. Newly inducted members may choose to recite together the GHHS Oath or another oath or reading of the inductees’ choosing. Each new chapter is awarded a one-time start-up grant of $2,000 to help with the costs of the Induction Ceremony and initial chapter activities. Formal recognition should also take place when other student honors and awards are bestowed, demonstrating the significance of the selection to GHHS. In addition, schools are expected to acknowledge student membership in GHHS at the graduation ceremonies. New GHHS members should meet soon after selection in the spring of their third year in order to bond and to determine the activities the group will pursue during their fourth year. Separate funding ranging to a maximum of $1500 is available for such activities through the GHHS Chapter Activity Grant Application process. Because building a network of advocates for compassionate health care is a critical mission of GHHS, mentoring is a key responsibility of every member of the Society. 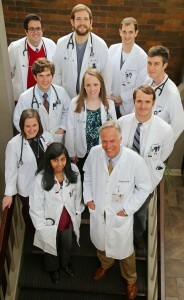 We encourage you to consider mentoring programs that will involve and educate all medical students at your institution. Please visit the Chapter Activities page to explore additional ideas for chapter programs and events.